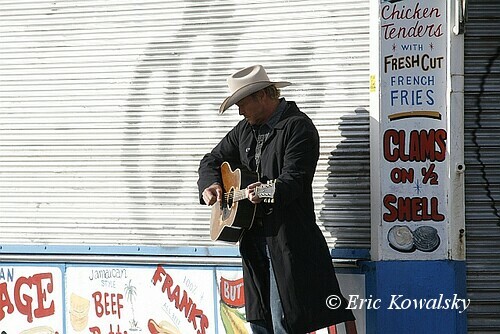 Alan Jackson Video Shoot on Coney Island Boardwalk! 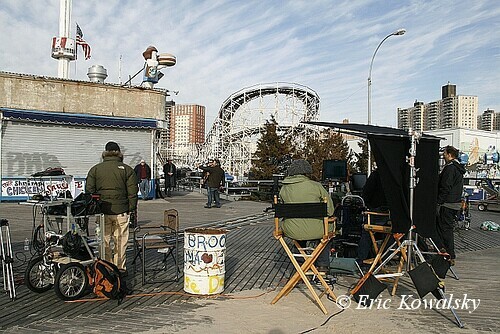 Coney Island remains a popular spot for video and film shoots, even after the amusement parks have closed for the season. On Friday, Nashville came to Coney when country music singer-songwriter Alan Jackson strummed his guitar on the Boardwalk in front of Paul’s Daughter. Thanks to Coney Island photographer Eric Kowalsky for being on the scene and getting these great photos of the video shoot. The name of the song Jackson was singing is privileged info, but we guess it’s from his upcoming album set for release in the Spring of 2012. The backdrop of the shuttered store and closed-down rides made us wonder if the tune is about the end of summer or perhaps the end of a love affair, as country songs often are. 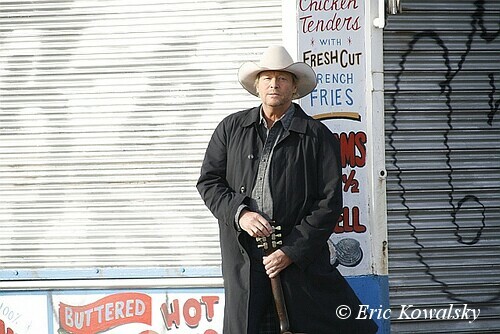 Jackson’s last video “Long Way to Go,” released this summer, is up for Great American Country’s Top 50 Videos of 2011. You can watch it on his YouTube channel. If the video crew had come a month ago, before Paul’s Daughter’s signage was removed to make way for the new “vision” for the Boardwalk, they could have used a masterpiece of Americana as a backdrop, not just the few signs left behind. The restaurant formerly known as Gregory & Paul’s and its frequently photographed signage were featured in the 1999 music video “Summer Girls” by LFO. It’s sad to see Coney’s hand-painted signage, which has a quirky character and an authentic patina, being forced out by the powers that be. Will the Coney Island Boardwalk remain a magnet for video and film shoots when it’s mostly shiny and new and neon? As one of the last few vestiges of truly authentic and wonderful country music, Alan Jackson continues to be one of my all-time favorites. His contributions to the genre, as well as his signature poetic writing style and deep southern voice make him one of the all-time greats. I am honored as a New Yorker to have had him use a wonderful piece of this fine city to shoot his video. Even though the bastards controlling the airwaves yanked the old 107.7 FM country station a few years back, leaving NYC with not a one, I continue to love everything about good solid country music. Alan, an additional thanks to you for all the lives you touched when God blessed you with the words to “Where Were You (When the World Stopped Turning)” on that fateful night that you woke up in a sweat and the words came to you in 15 minutes (true story). Best to ALL!